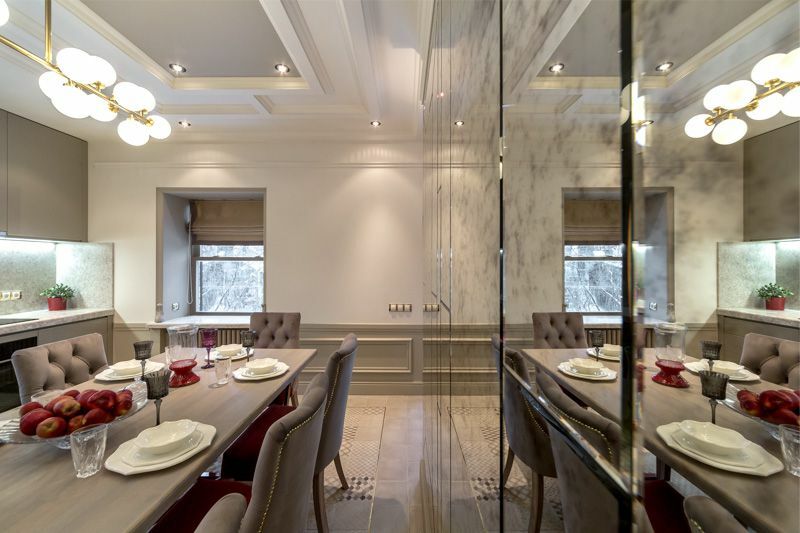 A kitchen area of ​​25-30 square meters allows you to carry out a lot of planning, decorating and technical capabilities, but at the same time leaves a lot of questions. 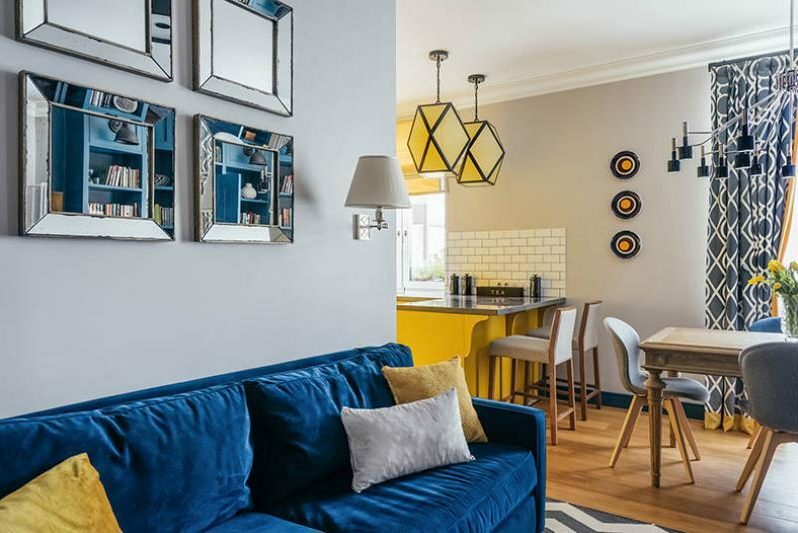 Moreover, often, such a spacious room is used as a multifunctional and not utilitarian space – as a kitchen-dining room, kitchen-living room or even a kitchen-dining-living room. In this piece, we formulated 10 tips to help you avoid mistakes and effectively utilize extra meters. 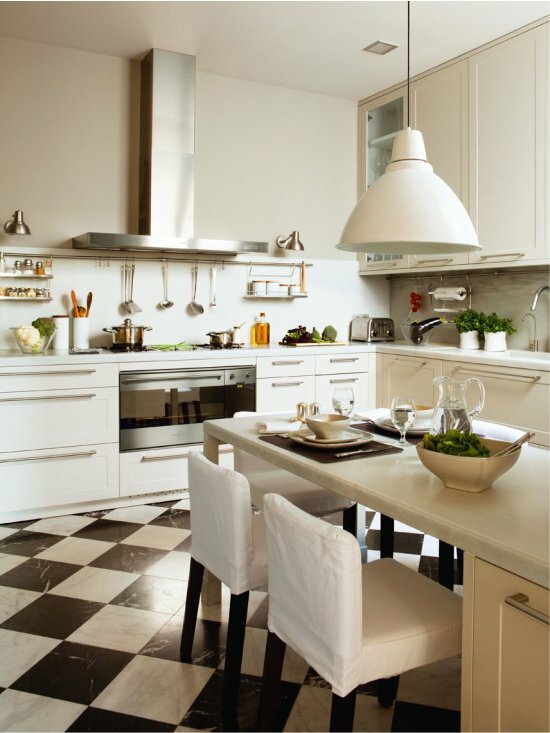 A common mistake in the arrangement of spacious kitchens is the non-observance of the rule of the “working triangle”. This is especially true of the refrigerator, which is often placed at a distance. 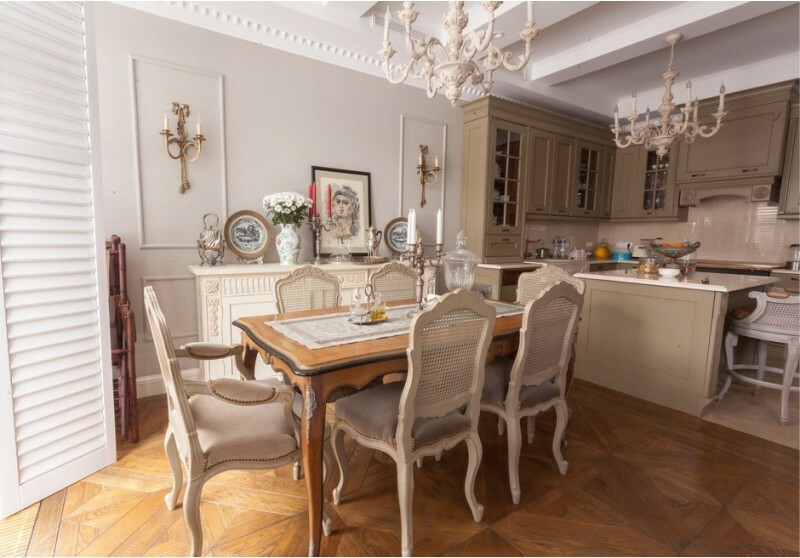 To make the kitchen comfortable, and ease your working, you need to place all three peaks of the working triangle near and so that between them there exist no barriers, like a dining table. Between the sink and the stove can be a distance of 60 to 180 cm, and between the sink and the fridge – from 45 cm to 2 meters.The smaller the distance between the work points, the more convenient working in the kitchen will be. From the point of view of the same “working triangle”, it is the U-shaped layout that is an ideal solution for a kitchen of 25-30 square meters, because it allows you to have everything you need literally at your fingertips. 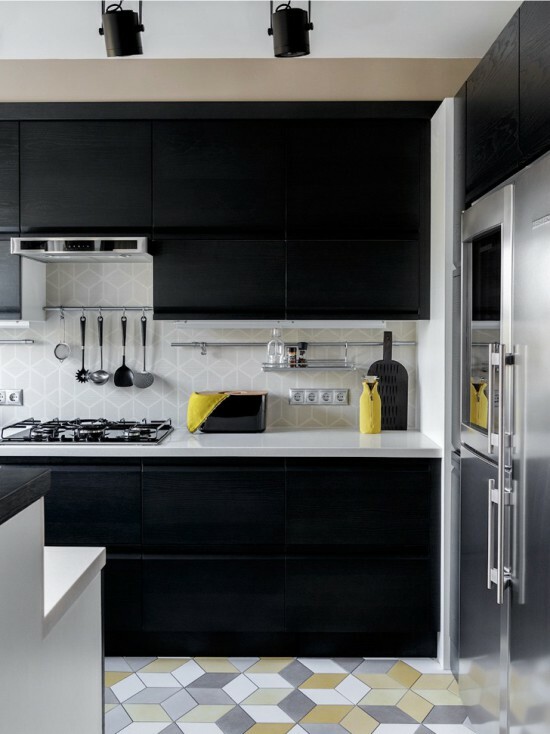 However, if you do not plan to equip the kitchen with an island (we’ll tell you about it later in the article), then the U-shaped set should be designed in a small size, so that the passage between the cupboards does not exceed 120 cm, otherwise the advantage of the U-shaped layout is lost. 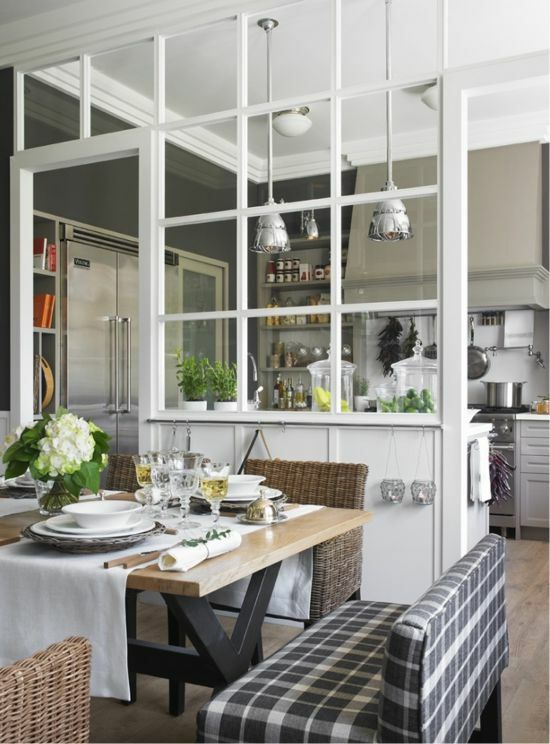 For a combined kitchen-living room or kitchen-living room-dining room, you should choose more compact layouts, for example, L-shaped (suitable for rectangular kitchens), double row (for a narrow room ) or linear (in combination with an island / peninsula). One of the bonuses of having a kitchen area of ​​25-30 square meters is the ability to equip the kitchen with an island, which is a multifunctional table for kitchen work and storage. Thanks to the island, you can create the perfect “working triangle” regardless of the form in which your headset is built. The island can be equipped with at least a stove and a bar counter and as a maximum – a stove, bar counter, sink, mini fridge and / or wine cabinet. 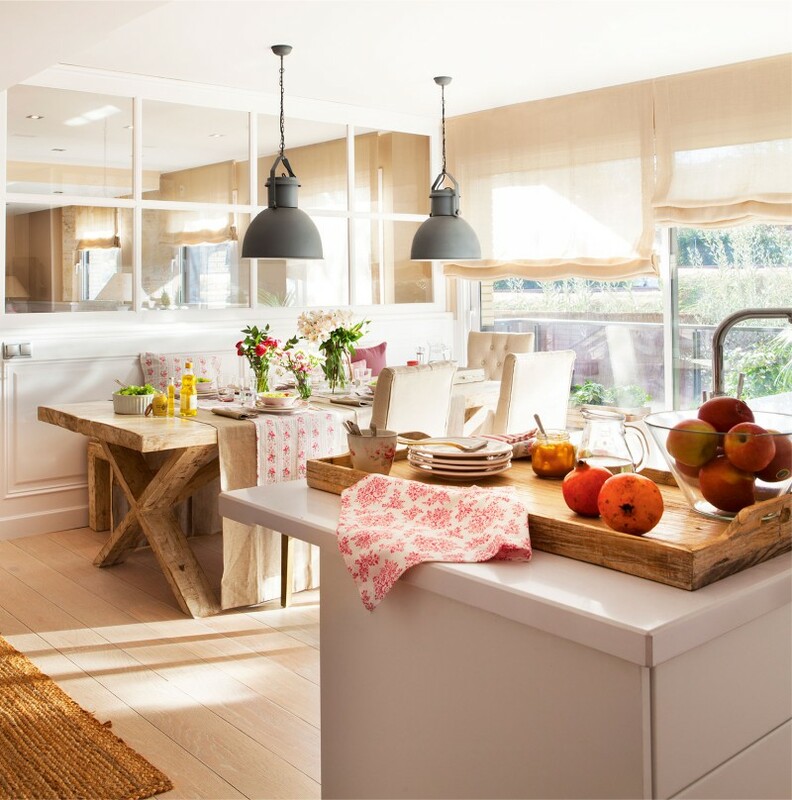 The island also splits space into zones – the kitchen, dining room and the living room. 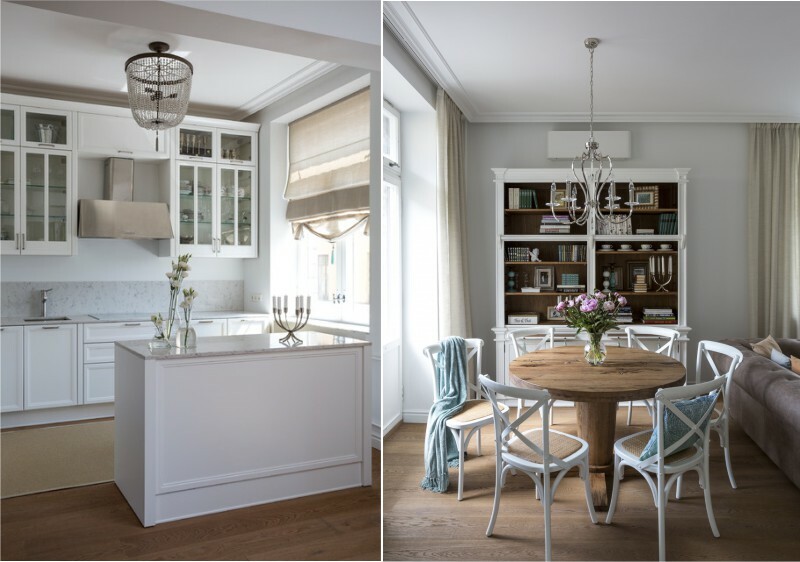 The main rule of choosing an island is that the passages around it must be at least 1 meter wide, and its shape must be similar to the shape of the room. 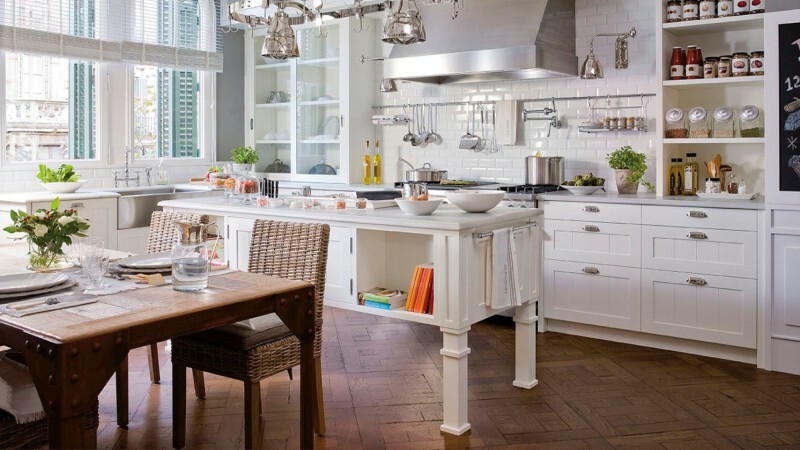 If you use the kitchen only as a working room or as a kitchen-dining room, then the island can be large. If you are building a kitchen-living room, then a compact island with a size of not more than 100 × 120 cm or a peninsula will do. A peninsula (see photo) is the same as an island, but with one end resting on the wall or in the headset. 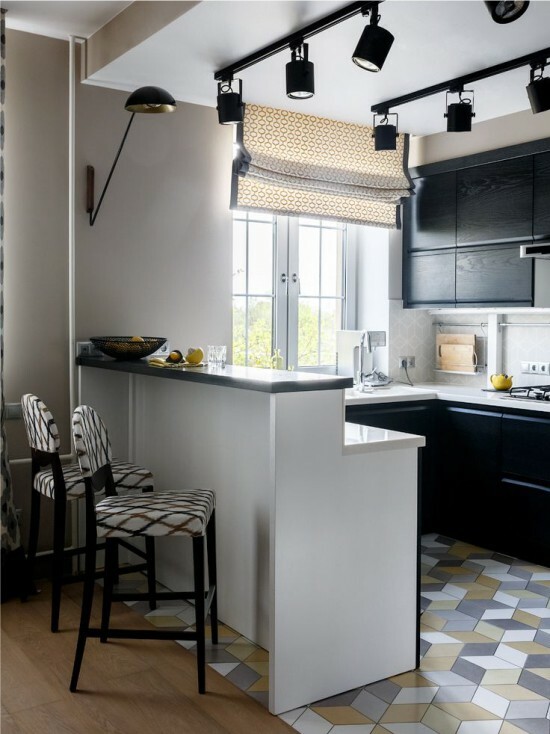 Even the most perfectly arranged kitchen can become uncomfortable if you plan your lighting improperly. For 25-30 square meters it should be uniform and neither dim nor too bright. 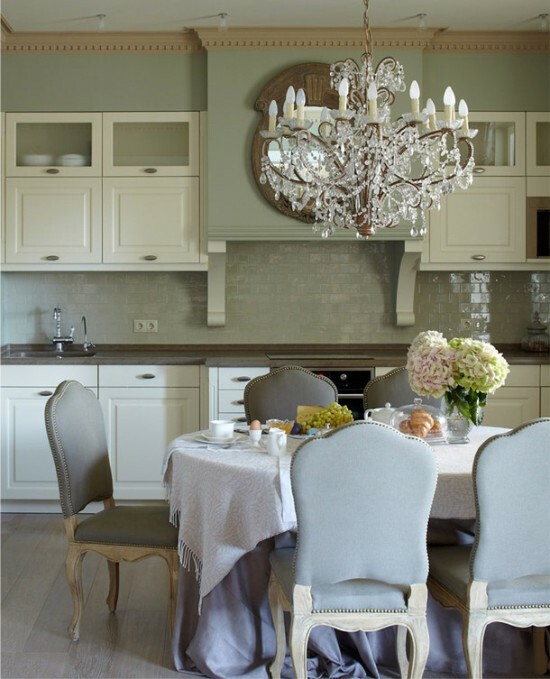 To achieve this, additional light sources should be used in addition to the ceiling chandelier . It is best to use spotlights arranged along the perimeter of the ceiling at a distance of about 30-70 cm from each other. Note that they cannot illuminate the whole room, but only the working area. Also, to create a uniform light, you can use wall sconces and floor lamps. 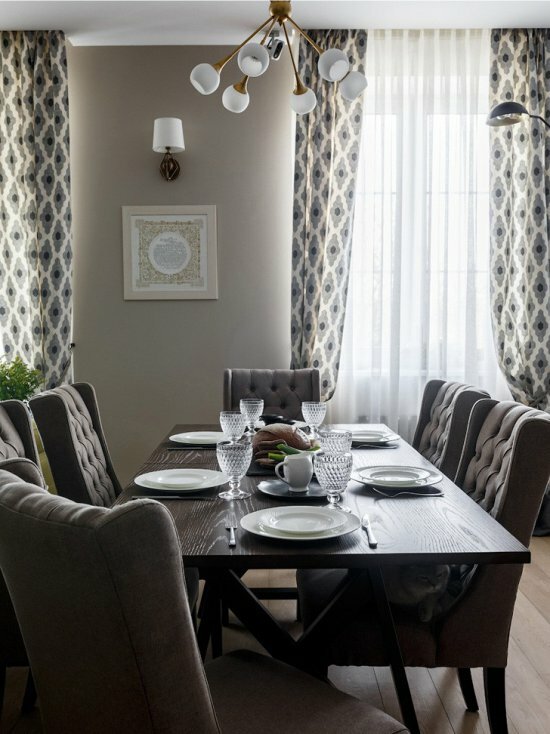 Ideally, the chandelier should not be placed in the center of the kitchen, but over the dining table (at a height of 70-90 cm from the countertop). 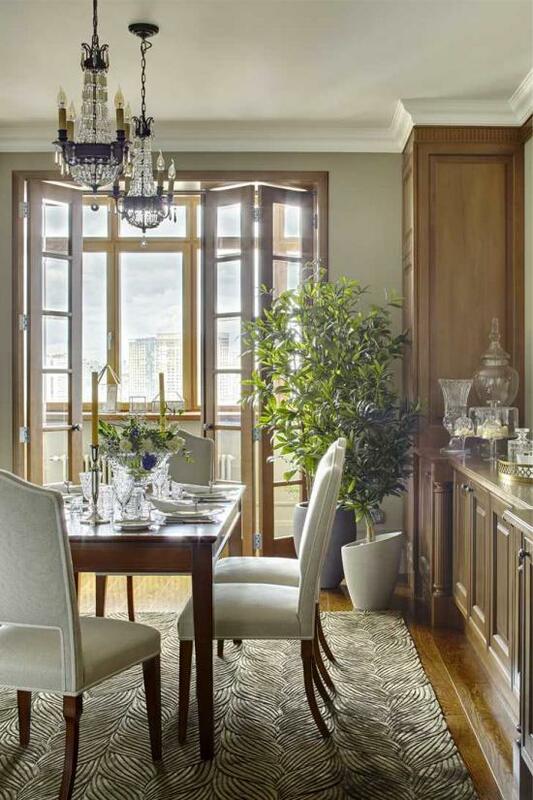 It is better if it is multifaceted, so that you not only light the dining area, but also visually divide the space. The island is best illuminated by a pair of three suspension light fixtures of concise design. 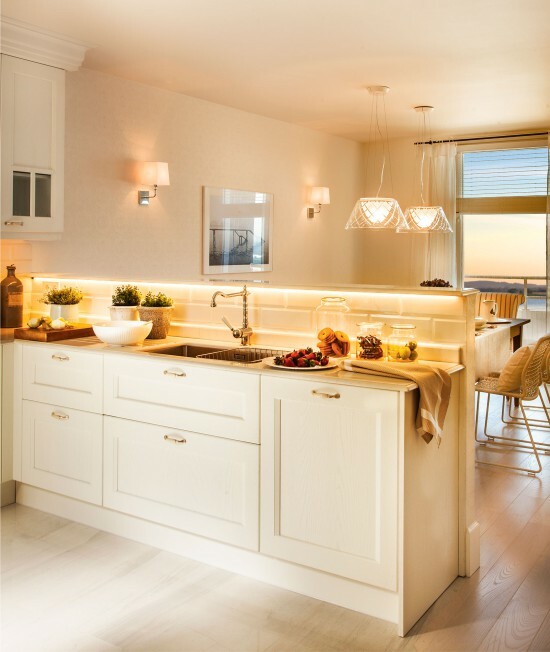 Its backlighting must be in the working area – above the countertop and above the hanging cabinets. 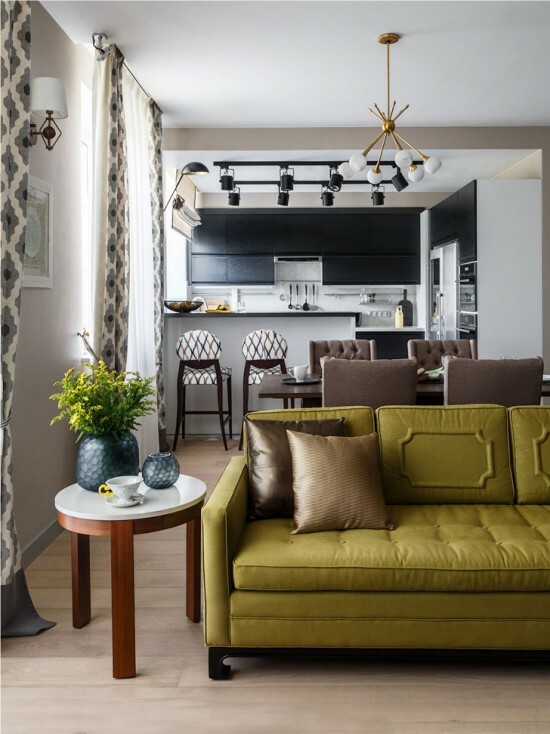 If the kitchen is combined with the living room, then the living room should be equipped not only with general lighting, but also independent lighting.Floor lamps and table lamps will create coziness and make a spacious room more intimate. 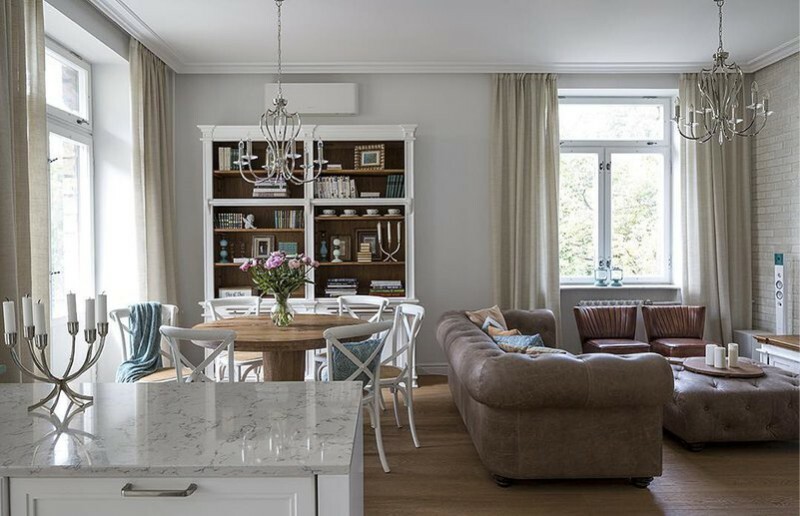 Thanks to a powerful hood, smells do not destruct those in the living / dining room and will not impregnate furniture upholstery, curtains, carpet and other textiles. For a kitchen of 25-30 square meters, a dome hood with a capacity of 1300-1600 m³/h is needed (the more, the better). 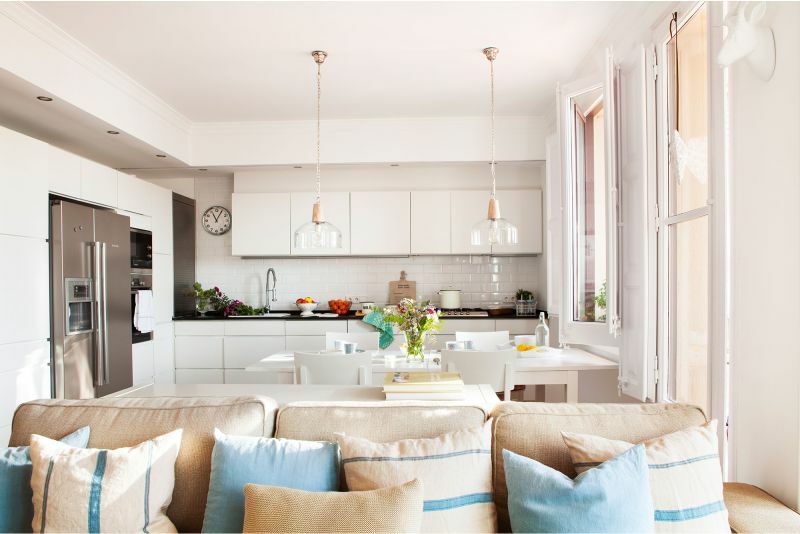 Maintaining a large kitchen is much more difficult than maintaining a standard one, more so when it comes to a combined kitchen-living room or kitchen with a grand dining room, because the mess in the work area spoils the general appearance of the room. 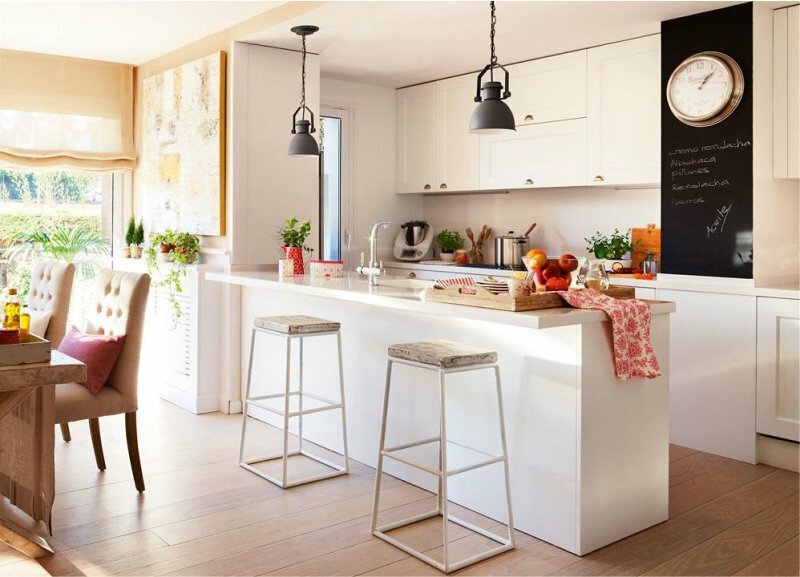 Here are some useful tips to help you create a kitchen that is easy to clean and difficult to smudge. Avoid use of the following facades, countertops, apron and floor dark shades (black, graphite, dark brown, dark green and dark blue).Dust, crumbs and stains on dark surfaces (especially glossy ones) are very noticeable. Give preference to an artificial, rather than a natural stone for facing the countertop and apron. Other suitable options are tiles and wood (for countertops). The most practical material for finishing the floor is tiles or granite . 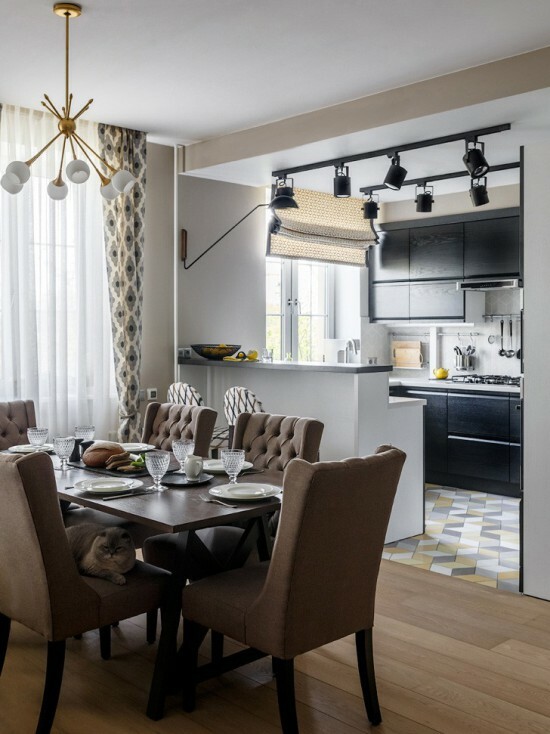 Using these materials in the kitchen-living room, you can only trim the working area, and the rest of the room can be fitted with any other material. Different floor finishes not only facilitate cleaning, but also zone the space. 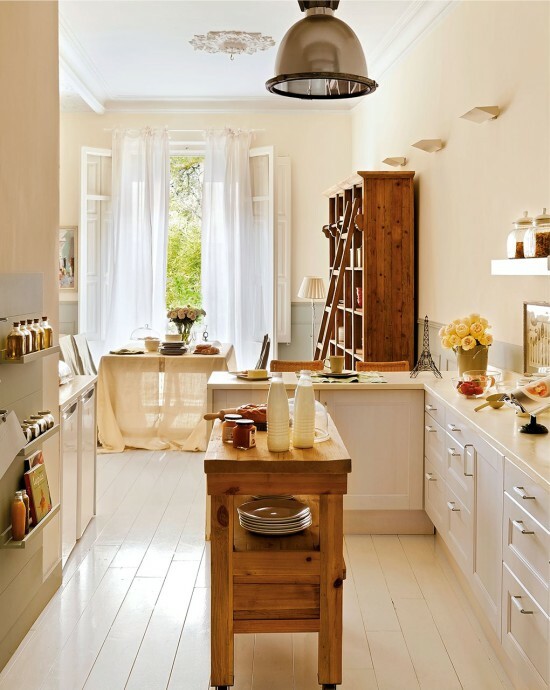 If the lower pedestals and the island contain most of the kitchen utensils and groceries, abandon the hanging lockers (on one or two walls) or replace them with a couple of open shelves. This solution will allow you to maintain a sense of spaciousness and visually open up the interior. Decorate the walls, floors and / or the ceiling in separate areas with different materials or in different colors. 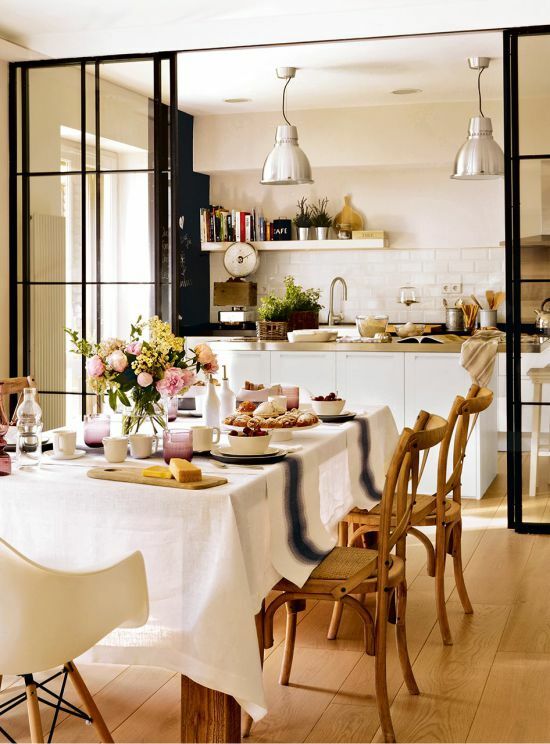 Example: tiles on the floor in the kitchen + parquet board in the living room, or, say, dark beige walls in the kitchen and light beige in the dining room. Separate zones with ceiling beams or other suspended structures. Use delimiter furniture: island, sofa, armchairs, bar rack, racks, etc. 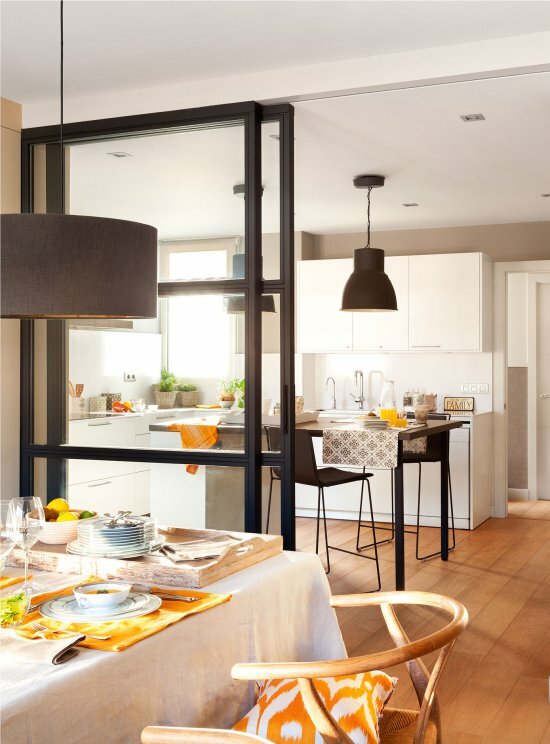 Below is an inspirational example of a zoned kitchen area of ​​30 square meters with a dining room and living room. Spread out the carpet in the dining / living area. 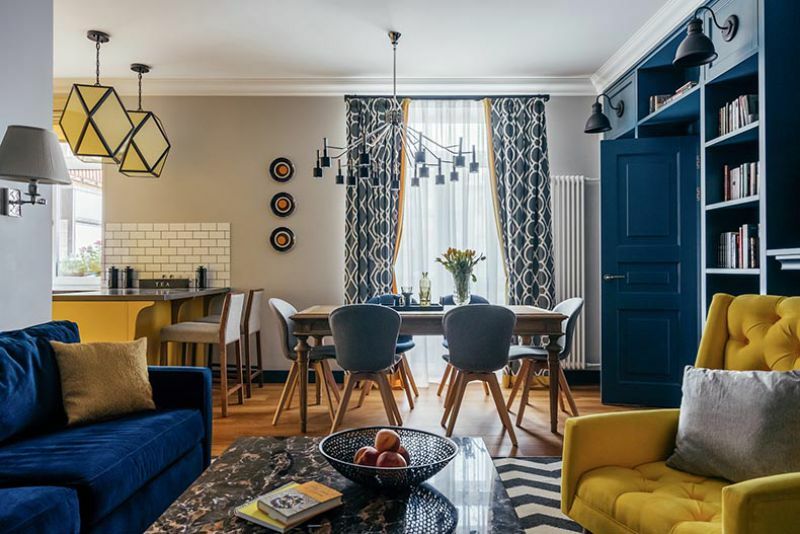 Of course, all the zones (living room, kitchen and dining room) have to possess a unifying aspect, in terms of colors, decoration, interior style, textiles, etc. 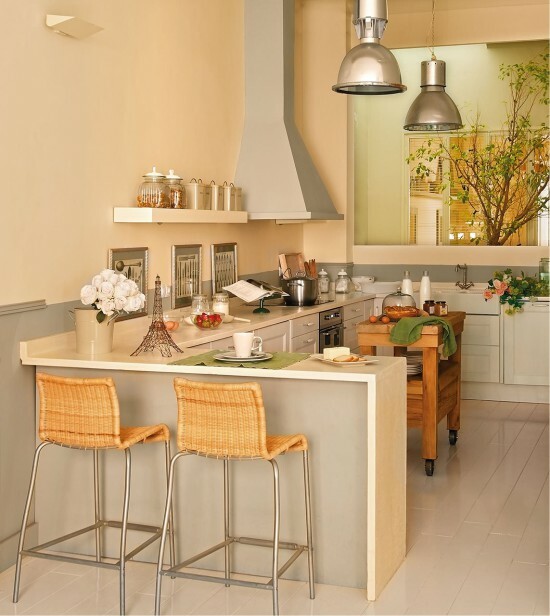 In a large kitchen, small accessories are lost and only clutter up the space. 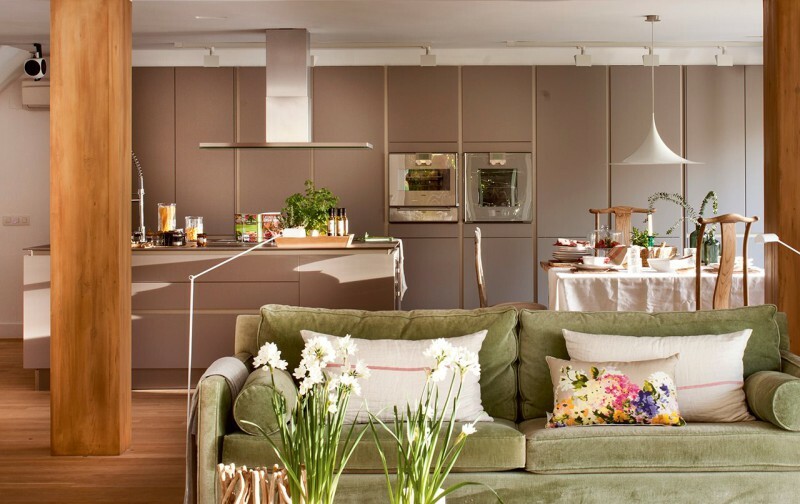 Most advantageous in the 25-30 square meter kitchen is the suitability of high and large objects of decoration. 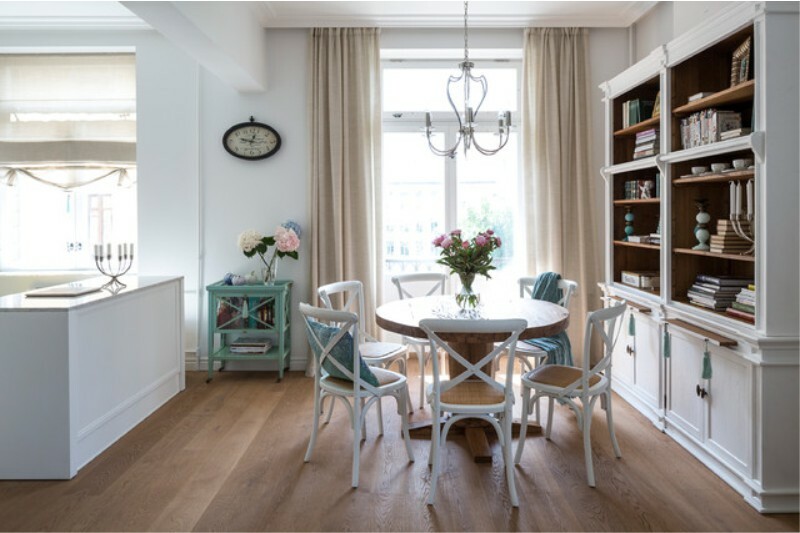 For example, you can hang a large round dial above the table / hood, hang one or two pictures of medium or large format on the walls or decorate the interior with a pair of tall and lush plants. The spacious kitchen allows you to not limit yourself in the choice of colors, prints, textures, decorative or architectural elements. So, for instance, for interior design, you can use wallpaper or curtains with large prints, without fear that the space will greatly diminish. Instead of light tables and chairs, you can use smart and massive ones. 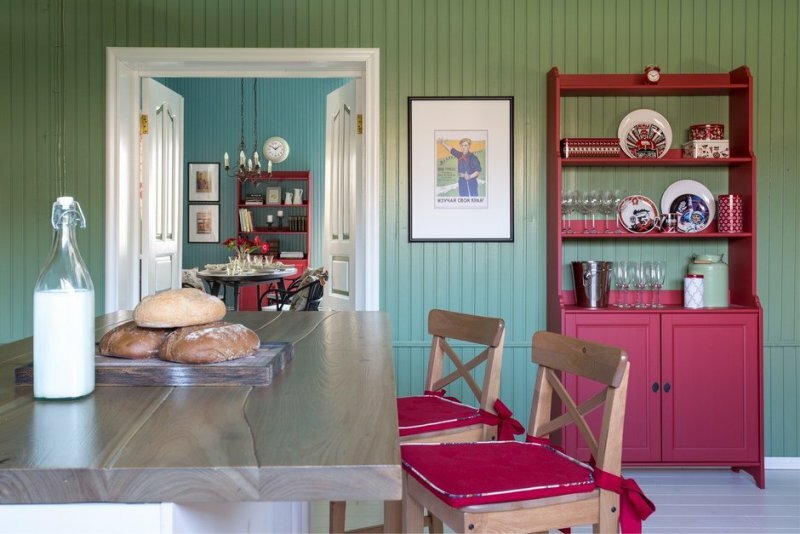 Also, instead of plain white-beige tones, use rich and even dark colors and other more complex color combinations. 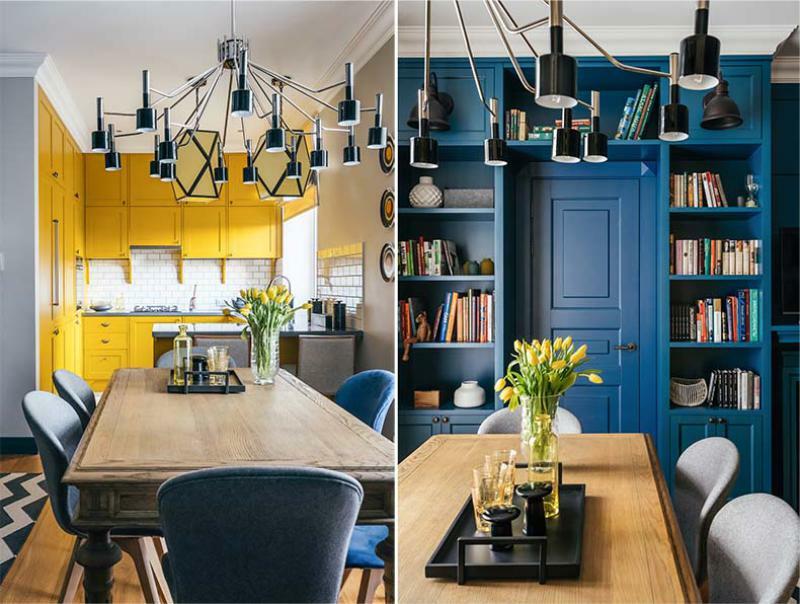 Below is an example of the design of a 30-square meter kitchen-living room in a yellow and blue color scheme and contrasting details . 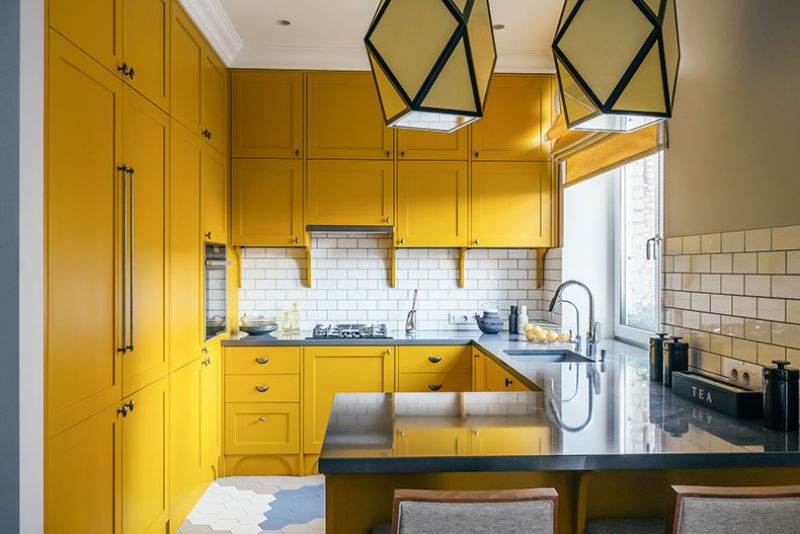 You should also note that rich shades, especially warm ones (red, terracotta, brown, yellow) can create a feeling of cheeriness in a spacious kitchen.